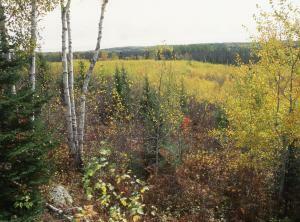 Biologists and conservationists created the Upper Great Lakes Young Forest Initiative in 2007 to promote the stewardship of early successional habitats (young forest and shrublands) in Michigan, Wisconsin, and Minnesota within Bird Conservation Regions 12 (Boreal Hardwood Transition) and 23 (Prairie Hardwood Transition). A stepdown of the Woodcock Conservation Plan for the Upper Great Lakes region outlines habitat goals. Partners have set up Demonstration Areas, including many on a landscape scale, to showcase habitat management techniques that help woodcock and other young-forest wildlife. An important partner is the Golden-Winged Warbler Working Group. The population of golden-winged warblers is also falling in the region, likely due at least in part to habitat loss. Other partners include the U.S. Fish and Wildlife Service, the U.S. Forest Service, Wisconsin Department of Natural Resources, Minnesota Department of Natural Resources, Michigan Department of Natural Resources, the Ruffed Grouse Society, Woodcock Minnesota, the National Fish and Wildlife Foundation, and the Wildlife Management Institute. Conservationists and scientists have identified high-priority management zones in the three-state region, based on predicted woodcock abundance, potential habitat, proportion of landscape in aspen, and land-ownership patterns. There are both effective and ineffective ways to make woodcock habitat. Wildlife biologists have developed a set of Best Management Practices presenting optimum methods of creating young-forest habitat on the landscape. Context of Management gives guidance on where, and where not, to actively manage land for woodcock. A Webless Migratory Game Bird Management Grant from the U.S. Fish and Wildlife Service helps fund this regional habitat initiative.